I have lost count of the amount times the question has been asked “how can I extract a planning applications outline”, until now the options have been pretty limited, one of the possible methods is to use LCM but it has its limitations and is not in the format that suits everybody. Since the arrival of version 11 the planning Outline Load utility has done wonders and has been improving with each release, it should have been around well before 11 but at least it did arrive. Now the utility is mainly aimed at classic planning applications, yes there are still many clients holding out with classic and why not. With the recent release of 11.1.2.1 the utility brings in the option to export dimension metadata which I didn't see mentioned in the planning new features document, so the utility has evolved as not just a loader but an extractor as well. The generated output CSV file is exactly the same easy manageable format that is required to load a dimension using the utility. It is also possible to extract attribute dimension metadata. To extract an attribute dimension all that is required is to provide the attribute name using the /D: parameter. It is possible to export all the Smart List metadata within an application. Once again the output format matches the one for importing. All the exchange rates tables available within the application are exported to the output CSV file. I am not here today to announce the release of 11.1.2.1 as I think the news has definitely has been posted enough times now, I’d be extremely shocked if you didn’t know, maybe you have been living in a cave and decided to visit my blog when you first ventured out. Now with this new release there are more options to move to it, you can upgrade/migrate from previous versions, fresh install or apply the maintenance patch to upgrade 11.1.2 to 11.1.2.1, some of this options I will be covering in future blogs. This release is also about bug fixes as masses have been addressed, there are a number enhancements and new features in a selection of the products but nothing ground breaking (you may disagree), it looks like planning has a larg share of them. As in past blogs I have gone through the installation and maintenance patches for previous releases so I thought I might as well share my experience of apply the maintenance release today. The release has only been around for a few days so I apologise if I provide any incorrect information. The OS the maintenance release is being applied to is windows 2008 x64 SP2. 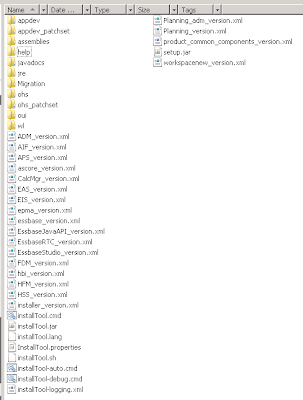 Next step is download all the required files, I usually obtain them from Oracle edelivery, the files that are required are covered in the install and config guide, note this release there are seven foundation files and not four, also don’t forget the additional content file. There are a number of extra folders at root level in this release. Now there is a list of prerequisites to be met before installing the Maintenance Release to move from 11.1.2 to 11.1.2.1, here is a summary of the main points. 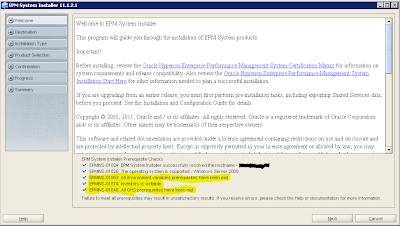 • You must apply the maintenance release on top of your existing EPM System installation. 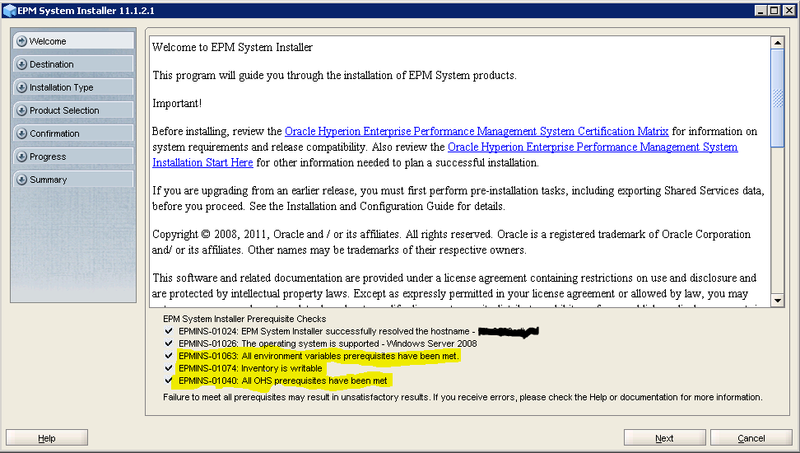 • You must apply the maintenance release to all EPM System products in the deployment. You cannot apply the maintenance release to only some products. 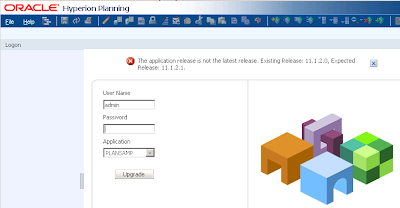 • If you are applying the maintenance release to move from EPM System release 11.1.2.0 to EPM System Release 11.1.2.1, or if you are reinstalling EPM System products, you must first stop all the services for EPM System products. 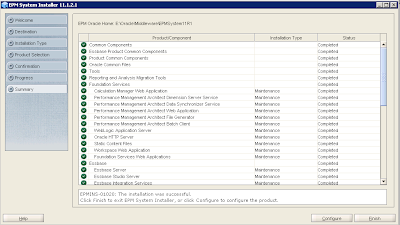 One more point before starting the installation is to be sure you have more than 5GB spare on the drive where EPM is currently installed, if there is not you will not be able to complete the installation steps. A new addition to the start up of the installer is the check whether UAC is enabled, I know this could cause problem with 11.1.2 if it was enabled, if it is enabled in this release a warning will be displayed and the installer will not start up. There are also a few more prerequisite checks, good news all have been passed. Nothing new on this screen, displays the current Middleware Home. Three main options to choose from and this time it is “Apply maintenance release”. Check that there is a tick in each of the products with “11.1.2.0.0” against them, if there is not then you have not downloaded and extracted all the required files. Once you click next a list of products to patched will be shown, click next again and the maintenance patching will start up, this is a good point to go and spend time doing something that is actually meaningful in life and then on your return hope the status is all green. All green, see it wasn’t worth hanging around staring at the screen. Click the Configure button, when I first installed 11.1.2 the configure button never worked but in this release it actually opened up the configurator. You have the choice whether to stick with the original instance or create a new one, I have no reason to change this so I kept with the default. The configurator should have checked all the pending tasks for each product that need configuring, I unchecked everything except foundation as I want to be sure there are no issues with the maintenance release, if there is a problem with foundation there wouldn’t be any point configuring the other products. Another reason for doing this is I have used a separate Oracle schema for each product database configuration, if you leave everything selected then it wouldn’t give the option to apply to separate schemas. This is just a personal preference Oracle no doubt recommends to leave all products checked and the choice is yours. 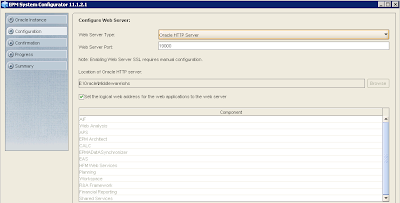 If you choose to only configure foundation then you would have “Configure Web Server” again when you configure the other products, this step should always be done last. 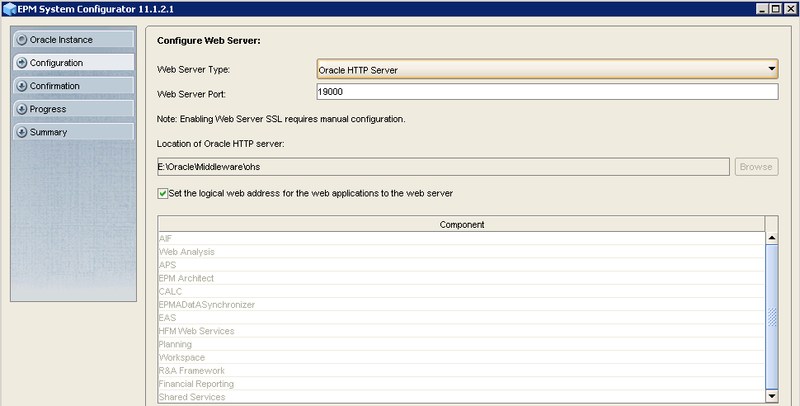 I do notice there is a new option “Setup connection to Oracle BI and Publisher”, it is not checked by default and I am not intending on changing that today. Keep “connect to a previously configured Shared Services database” selected. Once again there should be no need to change anything when applying the maintenance patch. Guess what, kept the defaults, can’t beat just clicking next. All green again, nice smooth ride up to now. Right that’s me satisfied, back to the configurator to run through the rest of the pending tasks product by product, remembering to check “Configure Web Server” in foundation as the last step, this may not be necessary as I have already configured the web server but I am not taking any chances. Instead of selecting uncheck all, I unchecked the products I was not configuring for, this way I knew the product I was configuring had the required tasks checked. I am not going to paste all the screens because as this is a maintenance release there were no new surprises and the process I followed was to stick with the defaults for each product, it was basically reconfiguring the database and redeploying the web application servers. The five non web app related services have been combined into one service called “Hyperion EPMA Server”. I also noticed after the deployment of the web applications the issue I posted about here has been resolved; the installer’s temporary directory is no longer used. I went through each product and quickly tested I could access them without problems, understandably this is not a rigourous test but it didn't show up any major issues, I will update this post if I do come across any. 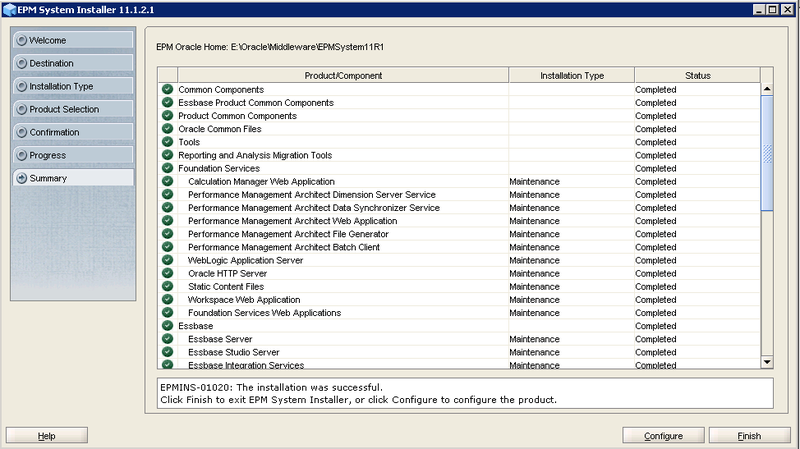 "After the installation and configuration of Enterprise Performance Management Architect 11.1.2.1.000, you must install Enterprise Performance Management Architect patch 11804477"